Coming from Lake Jipe we continued on the dirt/sand route up north, parallel to the Tanzania border, driving through towns like Taveta, Rombo & Oloitokitok. 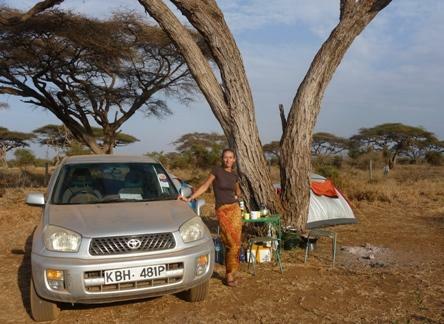 By the time we got to Amboseli National Park’s Kimana Gate, it was clear that something was wrong with the car, most likely something related to one of the back tires. We limped into the park and were directed to the Kenya Wildlife Service (KWS) Headquarters, hopefully to get a word on how bad the damage was. Thankfully a KWS mechanic had the car sorted out in no time and we were on the way to the campsite that is also run by them. Fortunately it is VERY close to the Headquarters, as at that point our nerves and patience were running out of control. It was a long, dusty day and the need for some coffee/tea, shower and some rest was on top of the list. 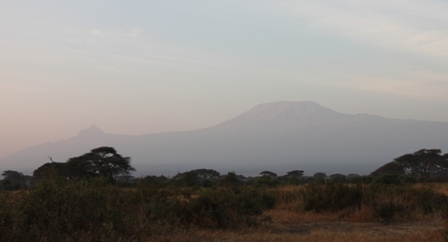 The KWS campsite is situated with a beautiful sight of Kilimajaro (Kili) and very close to the Kimana Gate. There are facilities, but VERY basic. Cold water for showers, and trust me, after a long day you don’t mind it! Tap water is there and some trees for shade. Keep in mind that it can be very windy just before dusk (September) and Kili can be very elusive. Luckily the next morning it was visible and I managed to get a few shots of the barely visible snow cap, just before the sun came out completely, and the mountain disappeared again. 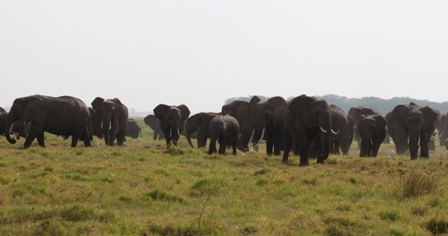 If you love elephants, this place is not to be missed while in Kenya! It is very easy to navigate the park and with or without map (although a map does come in handy), you can’t get lost and ele’s are everywhere. 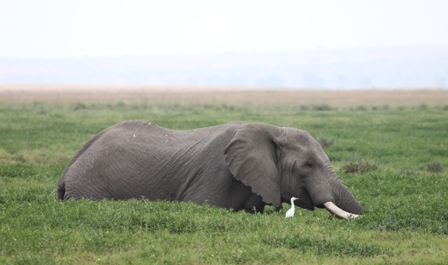 Beside the elephants, the other thing Amboseli is known for are the swamps and the consequent elephants in them. It is such a sight!!! After a full day of being out in the park and seeing everything from zebras, giraffes, wildebeest, buffalo, hippo, a lone lioness and of course the elephants, it was decided to stop at the Ol Tukai Lodge for a coffee and in my case a long awaited Amarula, the famous South African liquor! Back at camp after a delicious 'all-in-one-veggie-potato' creation and a clear, new moon, starry night, we planned our next part of the journey. Heading out of the park at Namanga Gate, the opposite way we came in, and then north towards Kajiado to meet new wonderful friends, before heading to the Maasai Mara National Reserve. Have YOU been at this campground? What did you think? Please share with us!